Shoreham's Tom Fraser on the ball in the Musselmen's 2-2 away draw with Little Common in the Premier Division on Saturday. Picture by Simon Newstead. 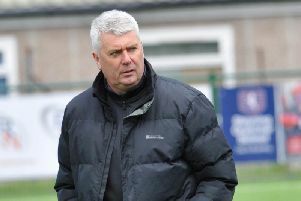 Shoreham boss Sammy Donnelly thought his players performed admirably in their 2-2 Premier Division draw away to inform Little Common on Saturday, but felt his side need to improve on their ‘grey areas’ as a late equaliser saw the Commoners take a share of the points. The hosts went ahead on eight minutes as Jamie Crone buried the ball past James Broadbent in the Musselmen goal after a defence-splitting pass from Commoners player-manager Russell Eldridge. Shoreham's Scott Kirkwood competes with Little Common's Wes Tate for the ball. Picture by Simon Newstead. Shoreham hit back on 29 minutes as Ryan McBride tucked home a penalty after a foul on Ross Myers. The Musselmen went ahead just two minutes after the break as Eldridge lost possession to McBride who slotted the ball through the legs of Little Common ‘keeper Matt Cruttwell. With the win seemingly sealed for Donnelly’s side, the home side got the equaliser with two minutes of the game left. A ball down the left from Commoners’ James Pool wasn’t cut out by the Shoreham defence, and Crone cut inside and fired past Broadbent to level. After this result, the Musselmen are unbeaten in three in the league and four in all competitions. Donnelly said: “They’ve won four games and drawn one in their last five matches so they were the team in form. Before the game I would have taken the draw but having them equalise on 89 minutes it was a bit of a kick, especially in the manner they scored. Action from Shoreham's 2-2 away draw with Little Common in the league on Saturday. Picture by Simon Newstead. “In the second half, although we were under pressure, we contained them quite well. I think the boys can take a lot of credit but I also think there’s a lot of improvement to come as well. “It was important not to give the ball away cheaply and that’s what happened late on. A long ball was played forward, we couldn’t look after it the way we should’ve done and they ended up with a goal. Donnelly singled out goalscorer McBride for praise and also hailed his side’s display after a number players played while not fully fit. He added: “We’ve signed a forward called Ryan McBride, and Ryan’s played for me before, and he was a major difference. I was very pleased with his performance. “I had three players carrying knocks that probably should have sat on the touchline. One was Tom Fraser, one was Stuart Tuck, and John Rhodie had to go to hospital before the game.